With these heart-warming family illustrations is to thank very easily. You open hearts of all mothers with these lovely bird family drawings! A beuatiful gift for mothers and childlovers of all ages. 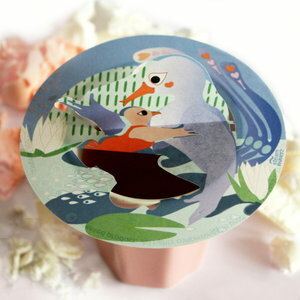 Twin Family is a set of two bird family dessins. Each Twin waverz holds two similar Steam Waverz. Order per 6 twins to surprise more friends with these adorable steam waverz. You receive two dessins in a variation of colors. Family dinner: Family dinner starts with the steam of your tea! Family Bird feeds their young ones in the nest. The young ones are doing their utmost best to receive their treat. Hugs: With this illustration you share hugs! The young one gives a heart-warming hug to the adult bird. 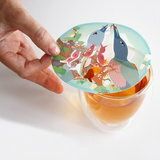 A steam waverz is a reusable paper product printed with food packaging ink. Patented product. Produced in Europe.